How to cite KIMBA data ? 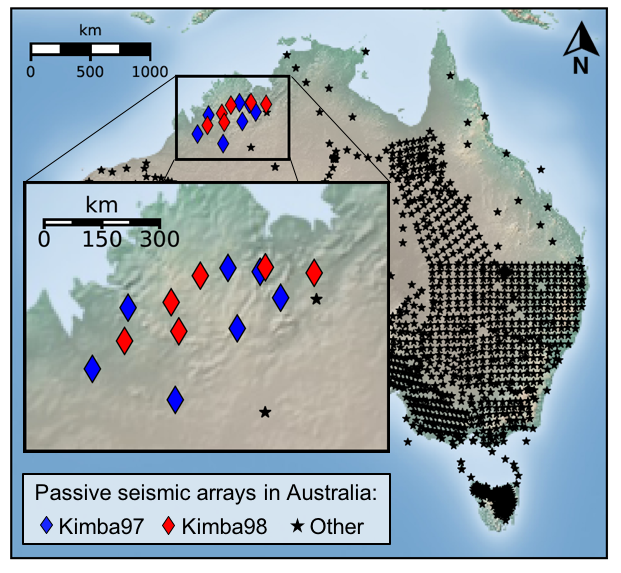 KIMBA was deployed in two stages (1997 and 1998) referenced separately. From July to October 1997, a set of broadband instruments were deployed in the Kimberley region, on the King Leopold and Halls creek fold belts, as well as the interior of the block. The array was designed to build on the information gained from SKIPPY and to improve knowledge of a region where very little geophysical investigation was available. The instruments used were the Guralp CMG-3ESP and Reftek recorders. From May to October 1998, a second seismic deployment was conducted in Kimberley, including the remote northern part of the region. The same type of instruments were used (Guralp CMG-3ESP and Reftek) and the station locations were chosen to improve the coverage of the region.